Do not attempt to photograph the rocks in the morning. It'll turn out like this. 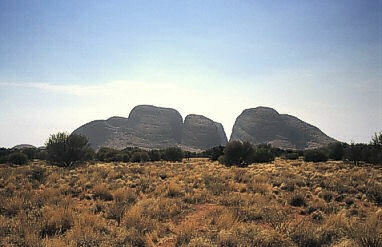 The Aboriginal word 'Kata Tjuta' means 'many heads' - a very suitable name. 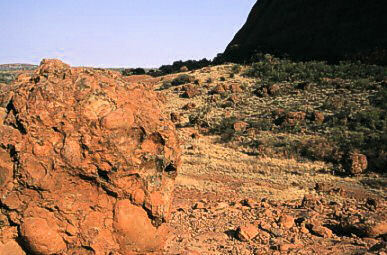 There are many stories, explanations and legends to tell in the outback. But none of them are about Kata Tjuta. It isn't the business of white people to know and so nobody tells us. Only that much: it is a sacred, male site. Aboriginal women are not even allowed to look at or know about the rocks meaning. So after the Aboriginal customs are getting more and more respected, it may come to the point white women are not allowed anymore to see them. Let's hope it won't get that far. Anyway there are some facts about the geology: The rocks are sand stone, but not the kind I saw before. When the ancient mountains were washed away, it happened the way one can observe in any little creek: bigger rocks and stones remain in the upper part, soft sands are washed far down, perhaps into the ocean. 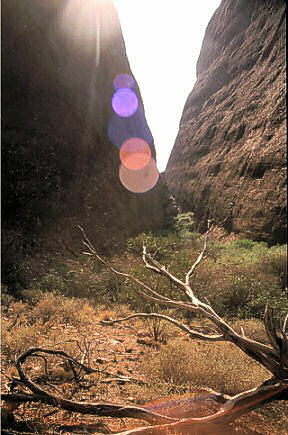 The general belief is Kata Tjuta and Uluru are the same large piece of sand stone. Kata Tjuta being the upper part, contains rocks and stones of different sizes, a conglomerat of everything. It does not look very solid and indeed there are many holes in the big rocks where the lumps at the ground have been.